Published: April 29, 2012 at 05:18 p.m. Updated: Aug. 4, 2012 at 03:59 a.m.
USC's Robert Woods is one of the nation's top receiver prospects heading into the 2012 college season. 1. 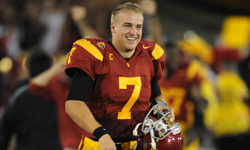 Matt Barkley, USC, QB: After bypassing an opportunity to enter the draft as a likely top-10 pick a season ago, Barkley is listed atop most draft boards as the No. 1 senior prospect. He has shown the ability to masterfully orchestrate a pro-style offense that puts a lot of responsibility on the quarterback at the line, but he needs to continue honing his throwing mechanics and arm strength to solidify his status as the potential No.1 pick. • Debate: Which team will pick No. 1 in 2013? 2. Marcus Lattimore*, South Carolina, RB: How well Lattimore recovers from his season-ending anterior cruciate ligament injury will ultimately determine his status as one of college football's top players. Evaluators are certainly impressed with his combination of size, strength and power. He bulls through defenders between the tackles, but also displays the burst to take it the distance on perimeter runs. 3. Robert Woods*, USC, WR: The Trojans have routinely featured some of the country's top receivers, and Woods is certainly carrying on the tradition with his extraordinary performance. He has dominated the Pac-12 over the past two seasons, and few receivers can rival his extraordinary ball skills. With the increased prominence of the passing game in the NFL, scouts will keep an eye on Woods' development over the next few years. 4. Jarvis Jones*, Georgia, OLB: Jones is the most dynamic pass rusher in college football. He possesses explosive first-step quickness and burst, and flashes the balance and body control needed to blow past blockers around the corner. While he is still learning the finer points of the position in pass coverage, Jones' ability to completely dominate the game as a pass rusher makes him a valued commodity in the eyes of evaluators. 5. Landry Jones, Oklahoma, QB: Jones was pegged as a potential first-round pick a year ago, but wisely elected to return to college to refine a few aspects of his game. He struggled with some of his decisions under pressure in 2011 and didn't display consistent accuracy or ball placement. Although those deficiencies have prompted scouts to downgrade him a bit, Jones is an undeniable A-list talent capable of vaulting to the top of the list by the end of next season. 6. Manti Te'o, Notre Dame, ILB: Inside linebackers aren't routinely valued at a premium, given the proliferation of the passing game at the pro level, but Te'o is a special player with extraordinary skills. He is athletic enough to roam freely from sideline to sideline against the run or pass while also providing a stout presence within the box. Given his unique skills and versatility, Te'o could emerge as a blue-chip talent by season's end. 7. Ricky Wagner, Wisconsin, OT: The Badgers traditionally feature big, physical offensive tackles with solid technical skills. Wagner certainly fits that mold and shines on the outside in isolated matchups. Although he still needs to clean up some of the rough patches in his game, Wagner is a franchise-caliber offensive tackle to keep an eye on in 2012. 8. Alex Okafor, Texas, DE: It's hard to find long, rangy edge defenders adept at playing the run and pass, but Okafor shows signs of being a special player. He excels at utilizing his length and athleticism to defeat blockers at the point of attack, and his remarkable closing burst allows him to hunt down quarterbacks from the backside. He also displays a non-stop motor that allows him to win consistently with energy and effort. 9. David Amerson*, North Carolina State, CB: Big, athletic corners with the instincts and movement skills to excel in "off" coverage are rare, but Amerson is looking like the exception to the rule after putting on a spectacular showing as a sophomore. He picked off 11 passes in 2011 and displayed game-changing skills that put the Wolfpack star square in the sights of evaluators. 10. Sam Montgomery*, LSU, DE/OLB: Montgomery is a pass-rushing specialist with explosive first-step quickness and burst. He shows the ability to bend and burst around the corner with balance and body control, but needs to continue to expand his pass-rush repertoire. If he can do that while also improving as a run defender, Montgomery could develop into a difference-maker that NFL coaches covet in a few years.